I would like to start off this post by asking that we all say a prayer for the missing Malaysia Airlines flight MH370. Hopefully, the plane is found as soon as possible so that the families and friends of the passengers find closure. Another mini tragedy happening in Malaysia is the water shortage. Alhamdulillah, it’s been raining so there’s been water. During the shortage though, I had to crash at my friend’s place. 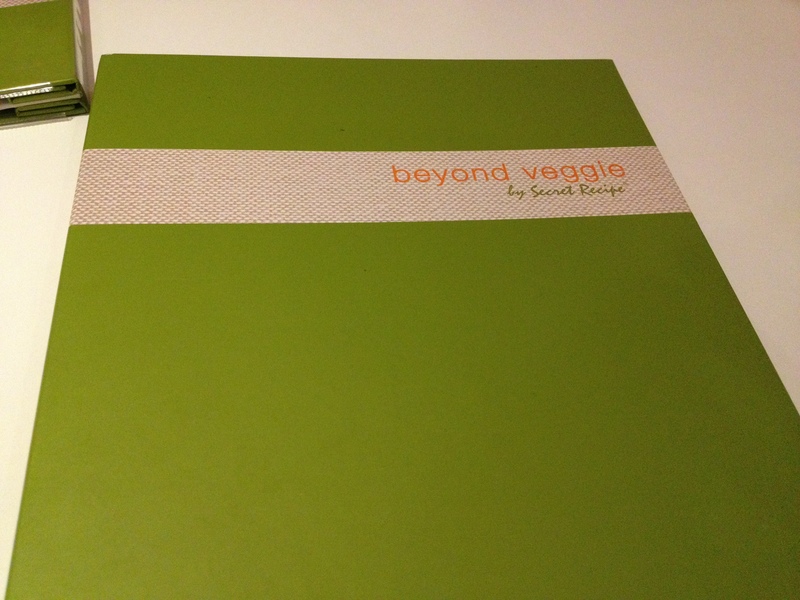 A little over a week ago, we had lunch at a vegetarian restaurant called Beyond Veggie by Secret Recipe. I can do without meat in my food unlike some of my fellow Nigerians BUT I can’t go without it for a long time. I applaud those who are vegetarian but it’s definitely not for me. 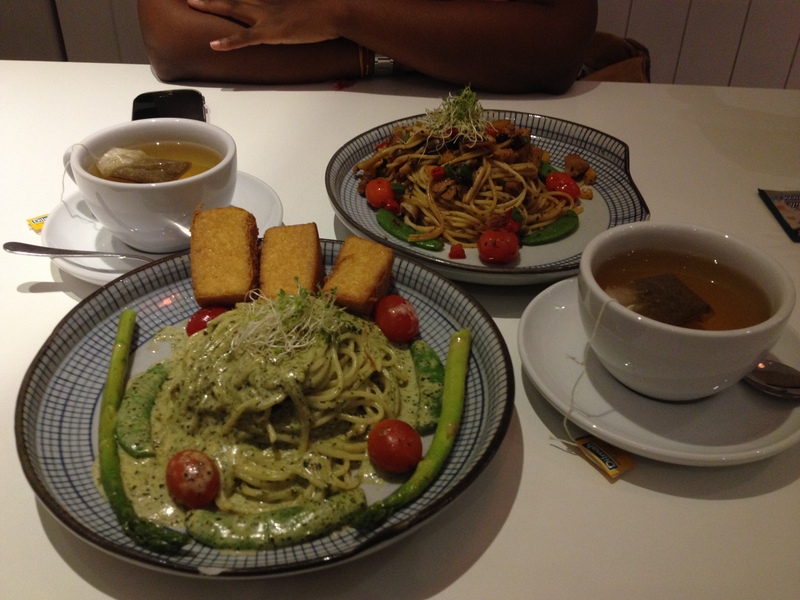 My friend and I both had pasta; I had the creamy pesto pasta with tofu while she had aglio olio with olives and sundried tomatoes. 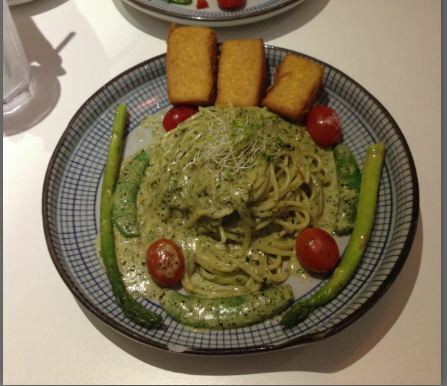 The creamy pesto sauce stayed true to its name. The sauce was very creamy and tasted of mint. A turn off was the strong spinach-y smell which I somehow didn’t taste as I was eating. There was also some sort of cheese in the pesto sauce and too much oil. 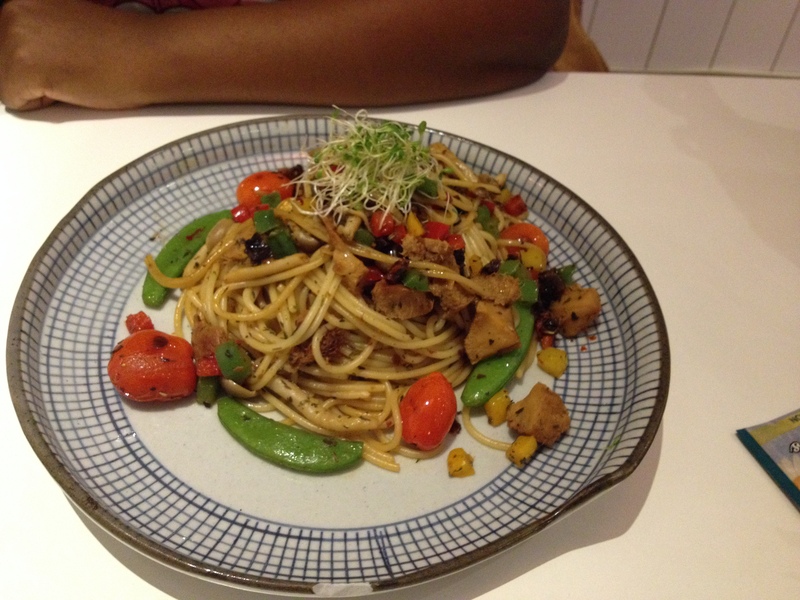 The pasta was cooked al dente which I loved! Pasta that has been overcooked is something I’m not a fan of. The tofu had been fried with a layer of egg making it crispy on the outside and custard-y on the inside. I didn’t really enjoy it. I like my tofu hard and dry. I tasted the shitake mushrooms from my friend’s dish and it tasted like meat which of course had me smiling. She enjoyed her food as well and there were no complaints. 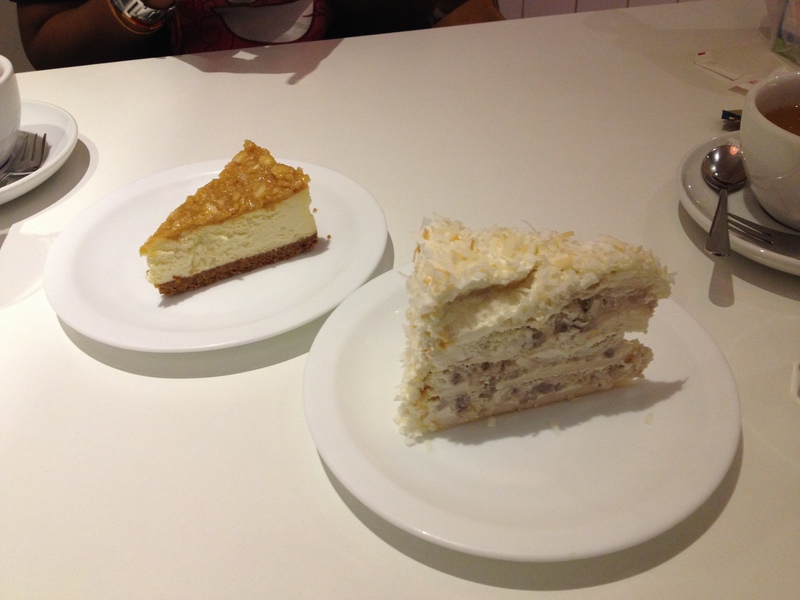 We also had dessert; macadamia cheesecake and ube yam. Until then, I had never tried nor seen a cake with yam in it so I was looking forward to tasting it. The macadamia cheesecake had a top layer of caramel which was mixed with the nuts and a biscuit base which was not as crumbly as I would have liked. I loved the cheese layer though. I thought the ube yam cake would be too sweet as it had layers of cream mixed with bits of yam and layers of chiffon cake. 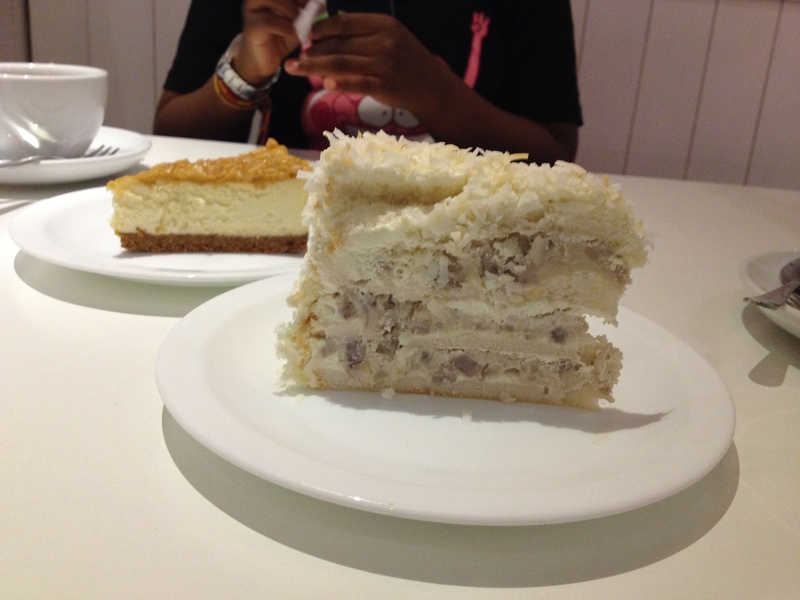 It also had a sprinkling of coconut strips on the top. On tasting it though, I was wrong. The cake had just the right amount of sweetness and is definitely one I would want to try again. Beyond Veggie has a tea time offer where you get a free cup of tea with any slice of cake. I’m not a big tea drinker (Milo is more my speed) but they had me at free. I decided to have chamomile tea and I HATED it. Aamin! My thoughts and prayers are with Malaysia and the affected families. Mo ti fi oorun ounje yen je eba. Delish! This is one place I MUST visit. Great post. Well done. Keep ’em coming. 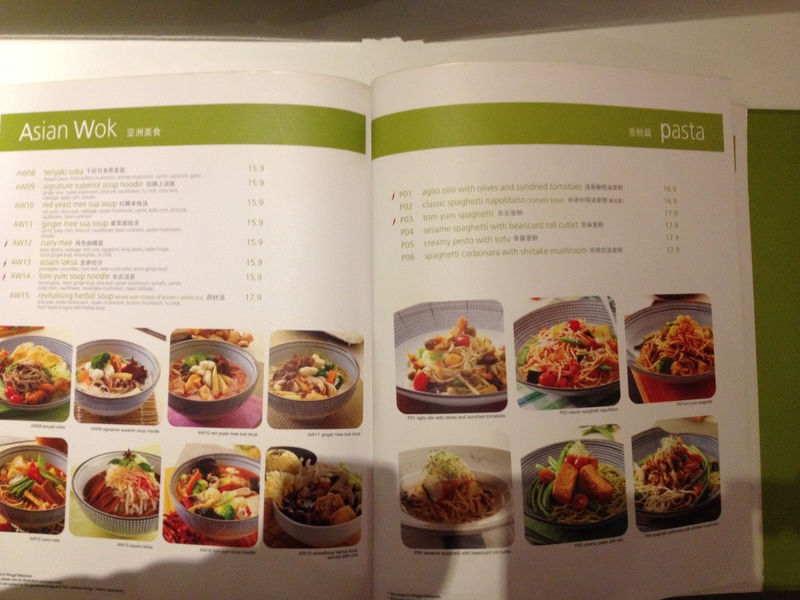 I think one can add as much pepper as they want to their vegetarian food; my meal wasn’t peppery though. I think vegetarian foods can be spicy.